More consumers are prepaying for their electricity. Are they getting a fair deal? About 40,000 households are now on prepay electricity meters. Globug, which has the lion’s share of the prepay market, has increased customer numbers by 56 percent this year after it dropped prices for community services cardholders and launched a high-profile ad campaign. Contact Energy has responded by dropping its prepay rates, which had been up to 40 percent higher than the cost of its post-pay plans. Moves to reduce tariffs mark a partial back-down for the industry, which has previously defended higher charges for prepay customers. But despite the price reductions, our comparison found some households on prepay meters can still pay hundreds of dollars more for electricity than households on standard post-pay plans. Prepay power has mainly been provided by the three largest electricity retailers: Genesis Energy, Contact Energy and Mighty River Power through its Globug brand. Genesis Energy has 3800 prepay customers, mostly in the central and lower North Island. Its prepay prices haven’t changed since 2011. The company has closed the plan to newcomers but our comparison found prices for existing customers can be 10 to 11 percent higher than rates for post-pay customers. For the same amount of electricity, a three- to four-person household in Hamilton on Genesis’ prepay plan would pay $313 more each year than an equivalent household on the company’s cheapest post-pay option. For a Wellington household, the difference was $251. Contact Energy’s recent rate drop reduced the gap between its prepay and post-pay options. But prepay rates remain higher than the cost of the company’s cheapest post-pay plan. In Wellington, the difference was 12 percent. Rates were between 3 and 6 percent higher for prepay customers in Auckland, Christchurch and Dunedin. Globug’s prices differ significantly depending on whether customers have a community services card. The company’s decision this year to drop rates for cardholders and its 18,000 existing customers earned it plaudits and was welcomed by budgeting services. Globug’s rates for cardholders are the lowest of the three prepay providers. In four of the five centres we looked at, they were also lower than post-pay options offered by Mercury Energy, another brand in the Mighty River Power stable. In Hamilton, Globug had the lowest price offer of the retailers listed on our Powerswitch comparison site. In Christchurch, it was number two. Wellington was an exception. Annual prepay costs for a three- to four-person Wellington household were $48 more than Mercury Energy’s cheapest plan. When average top-up costs were included, the difference was $60 to $90. 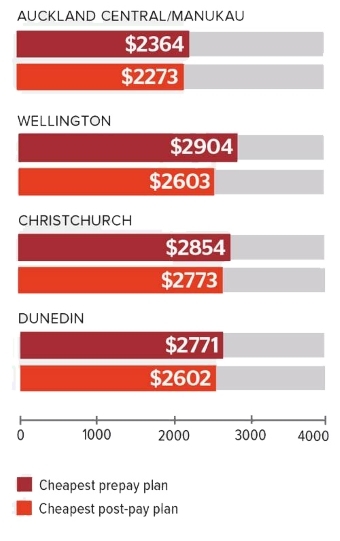 Annual costs in Auckland were also close to Mercury’s cheapest price after top-up costs were added. But for new Globug customers who don’t qualify for a community services card, rates were substantially higher. 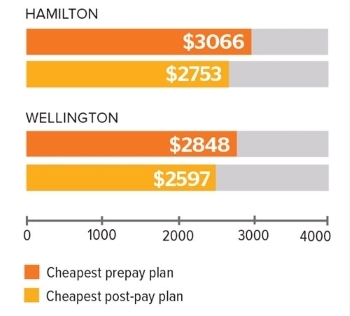 In Hamilton, a three- to four-person household could pay over $800 more on prepay than on Mercury’s cheapest post-pay plan. Prices in the other four centres were between 12 to 22 percent higher. Income limits for a community services card mean some households with relatively modest earnings won't be eligible for Globug’s discounted rates. For a single person, the income limit for a card is $27,637 a year before tax, for a couple it’s $41,327. The cap rises to $59,093 for a family of three and $67,282 for a family of four. Prepay power has been credited with helping households manage rising energy costs. Paying for electricity in advance means customers know what they’re spending and avoid an unexpectedly high bill at the end of the month. But the flipside is prepay customers are stuck with a more restrictive electricity service. Unlike post-pay customers, they can’t use power if they haven’t paid for it, one of the grounds on which discounted tariffs can be justified. The cost of prepay electricity is important because research both here and overseas suggests households on prepay plans are more likely to experience fuel poverty and be unable to afford adequate home heating. Dr Kim O’Sullivan, a postdoctoral fellow at the University of Otago who has researched prepay use, says prepay meters can enable consumers to make informed choices about how they spend their electricity dollars but they can also encourage households to restrict heating. A survey of 192 prepay customers she carried out in 2011 found 57 percent reported cutting back on heating. That’s a problem when many New Zealand homes aren’t warm enough to maintain good health, she says. Seventy-two percent of households with children also reported having the house colder than they would have liked during winter. Some households may not be on prepay meters by choice. Customers deemed a credit risk may have no other option than prepay, Dr O’Sullivan says. 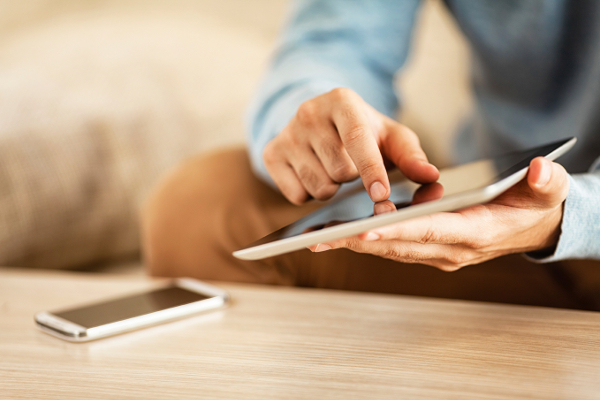 Switching to prepay may also be the only option for consumers who have been disconnected. More than 20,000 households had their electricity disconnected last year for non-payment of bills. Figures on the numbers of prepay customers who run out of credit and self-disconnect aren’t collected and there’s been no recent research to assess how the prepay market is working. According to Globug, most of its customers use the same amount of power when they switch, some use less and just under 20 percent use more. In other countries where prepay use has grown, regulators have signalled the need to improve consumer protections. A June 2015 review by the UK’s Office of Gas and Electricity Markets flagged changes to ensure prepay customers could switch easily, were treated fairly and did not face disproportionate costs, singling out installation charges and bonds. About 15 percent of UK consumers are on prepay meters. More than 60 percent of meters are installed as a result of debt. In Northern Ireland, where 41 percent of domestic consumers are on prepay meters, the regulator has introduced a code of practice on services for prepay customers. It’s also adopted a goal of ensuring vulnerable consumers have the same access to utility services as other consumers. Here, there are no specific protections for prepay customers and limited monitoring of services. The Electricity Authority says it doesn’t routinely collect information on the type of contracts each retailer has with its customers. Interventions have been limited to voluntary guidelines for assisting vulnerable consumers. The guidelines recommend retailers offer prepay meters to consumers who may be having difficulty paying bills. However, they don’t contain any expectations for the service standards prepay customers should receive. Despite recent prices drops, some households on prepay plans are still paying hundreds of dollars more for power than post-pay customers. Monitoring of prepay services is needed to ensure consumers aren’t unfairly disadvantaged and adequate safeguards are in place. Power costs: Our comparison found PrePower rates in Auckland, Wellington, Christchurch and Dunedin were 3 to 12 percent higher than Contact Energy’s cheapest post-pay plans. Top-up costs: Free at Postshop or by phone. Other costs: $140 to install or remove a meter, $130 to install or remove a meter keypad, $120 to process a refund, $120 to switch to post-pay, $10 for a replacement PrePower card to top-up in-store. Customers: 3800. Incharge Prepay is closed to new customers. Existing customers are mainly in the central and lower North Island. Power costs: Our comparison found Incharge Prepay rates in Hamilton and Wellington were 10 to 11 percent higher than Genesis Energy’s cheapest post-pay plans. Power costs: Our comparison found Globug rates for community services cardholders in four of five main centres were cheaper than Mercury Energy’s cheapest post-pay plan. However, rates for new customers who don’t qualify for a card were 12 to 29 percent higher. Top-up costs: 75¢ in-store, 40¢ debit/credit card, 20¢ for internet banking. Other costs: $70 for Globug display (optional), $35 to process a refund, $25 for replacement cards to top-up in-store (pack of three), 20¢ balance alerts or inquiries by text message. Email alerts are free. Our data were collected in August 2015 from Powerswitch and retailers for available plans in five main centres. Annual costs are based on a three- to four-person household with electricity used for hot water, heating and cooking and with one person usually home on weekdays. 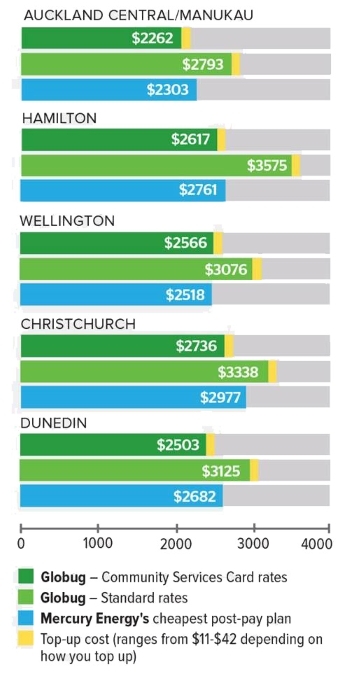 Auckland prices are for the central Auckland and Manukau network. Globug top-up costs assume 56 top-ups per year (costs range from 20¢ to top-up via internet banking to 75¢ in-store). Cheapest post-pay plan shows the cheapest plan offered by the retailer and includes electronic and prompt-payment discounts. Prepay customers face other costs, not just the cost of their power use. With Contact Energy, there’s a $140 fee to have a prepay meter installed. The company can also charge $120 to process a refund. If customers want to switch to a post-pay plan, there may also be a $120 fee. 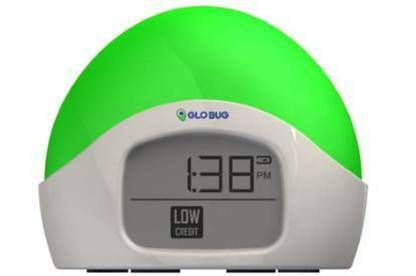 Globug customers don’t pay for a meter installation but they do have to pay each time they top-up. It’s 75¢ in-store, 40¢ by debit or credit card and 20¢ via internet banking. There’s a $35 refund processing fee. Globug customers who want the company’s in-home display also pay $70 for the unit. Dubbed “Glowy” in the company’s ads, the unit glows orange when credit gets low and red to signal power will be disconnected unless the account is topped up. Globug general manager Luke Blincoe says the unit is optional but most customers get it and pay off the cost when they top up. Since the company re-launched its smartphone app, he says fewer customers want the display and instead manage their account through the app or the Globug website. Some Globug customers are also paying off outstanding electricity debt. Mr Blincoe says about 6 percent of customers are in this position. Each time they top up, 25 percent of the amount paid is earmarked for debt repayments. The proportion drops to 10 percent in winter.